Truth is a life-giving relationship to Reality, and the search for Truth is the search for life itself, asserts this Quaker educator. Thomas Shipley Brown was born in 1912 in Philadelphia into a family of noted Quaker teachers and campers, and educated at Westtown, Haverford and Harvard. He taught at Westtown from 1936 to 1948. After a year at the Union Theological Seminary, he was a member of the department of religion at Earlham College between 1949 and 1953. He returned to Westtown for the next decade. In 1963, he became principal of the Olney Friends School in Barnesville, Ohio. In the late sixties he left Olney to become the executive director of the Friends Council on Education. He held this position until his retirement in 1977. Although retired, in the formal sense of the term, Tom Brown sat on many committees, including the boards of Westtown and Pendle Hill. He also clerked Philadelphia Yearly Meeting for three years, and served Friends in numerous other capacities. 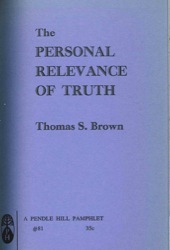 Thomas Brown balanced his responsibilities in Friends education with an abiding interest in the natural world. His family ran a camp in the Adirondacks where he worked with his sister, guiding vacationers by canoe and on trails. The Brown family also spent many happy hours gardening and canning their food. Tom Brown currently lives at Kendal in Kennett Square, Pennsylvania.